Kerstin Bräsch for DAS INSTITUT, And Let Me Know What You Think; Den Moch Ma! ; Gib Mir Kraft (all from "New Images/ Unisex" series), 2009. Oil on paper, 72 x 110 in. This dreamy little fable serves as an excellent metaphor for the cycles of modern art. The leopards are the artists of the avant-garde, instinctive animals like Picasso, Pollock and Julian Schnabel who desecrate the hallowed precincts of high art and introduce a wild new beauty and freedom. But then they keep coming back. Their once revolutionary gestures become routine, and they are absorbed into the pantheon. No one here, however, is likely to topple the current regime of art, and in that respect these artists stand for the majority of contemporary strivers. They are resourceful, alert and eager to please, but are not wildly imaginative. Call them the mild ones. Nina Hoffmann, Motiv [detail], 2009. 35mm slide projection (81 images), dimensions variable. Ken Johnson's reading of SculptureCenter curator Fionn Meade's "Leopards in the Temple" is one of the best reviews the Times has run this year: rigorously polemical, comprehensive, and historically grounded. I also think it is mostly right. For a century, the avant-garde has attacked, been canonized, and returned again, ad infinitum. Johnson wants to position the artists here in that "Leopard" lineage, though his choice of examples is odd: Picasso, Pollock, and Schnabel, three devout Modernists, with whom the show's artists have little in common, aesthetically or politically. Unlike Picasso and company, most of the artists in the "Leopards in the Temples," seem little interested in "wild new beauty and freedom," as Johnson would have it. They aren't aiming to murder their forebears. Johnson writes, "Viewers unfamiliar with what’s been going on in art in the past 50 years might find some works outrageous." However, one suspects that the show's artists, at least, are familiar with that art. They aren't looking to provoke outrage; they are happy to tweak and twist that recent art — particularly of the conceptual, relational, and, neo-minimal strain — into smart, new aesthetic experiences. Picasso doesn't need to be murdered when Daniel Buren can be gently detourned. The days of ransacking the temple are over. 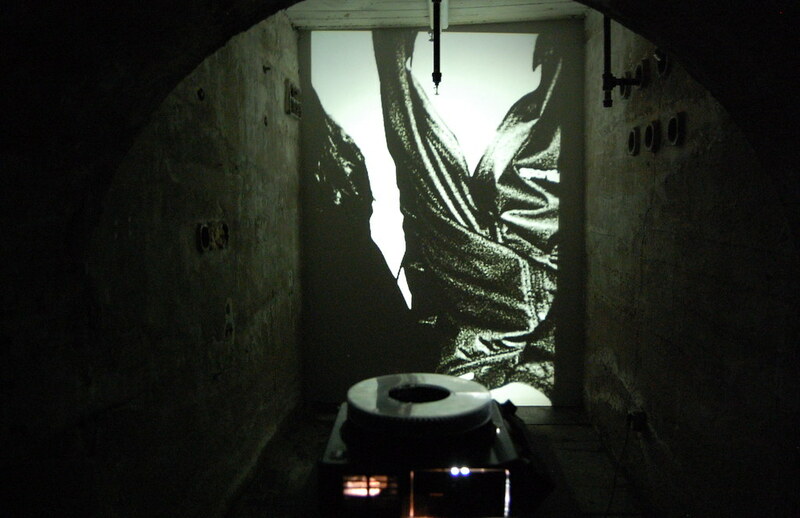 Kathrin Sonntag, Tango [still], 2006. 8mm film transferred to video, 2 min. 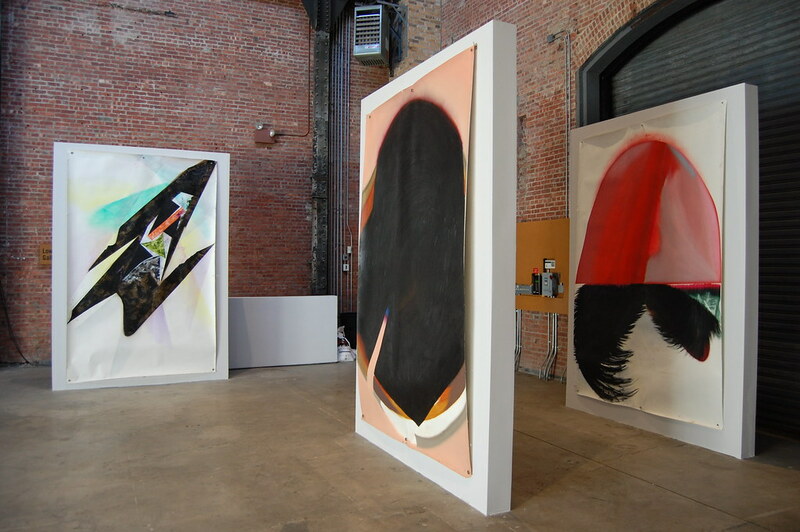 Lucas Knipscher, The Back Is As Big As The Front [detail], 2010. 4 yards of 100 white 2 x 2 in. 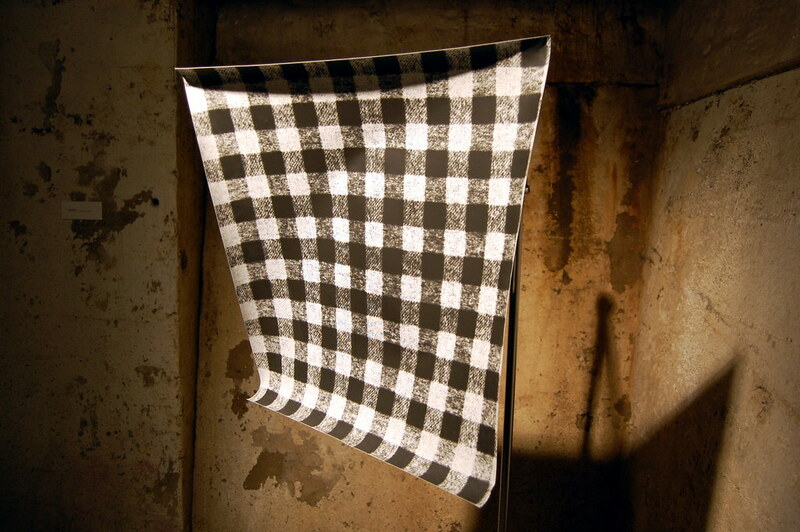 Heritage Buffalo Hunting Plaid from Woolrich Fabrics, Woodrich, PA; One-Way/Two-Way Mirror Window Film with Silk Screen of Heritage Buffalo Hunting Plaid 101 1.25 x 1 1.5 in. B; Heritage Buffalo Hunting Plaid 101 White 1.25 x 1.5 in. B Photocopied on Greyback Canvas; Four Texts from Camera Lucida by Roland Barthes (Removed from Four Sheets of Vinyl); Two Photographs from the Seattle Arts Commission Photo Survey by Larry Fink in the Collection of the Smithsonian and the Collection of Woolrich Woolen Mills (WP Lavori and Corso srl, Bologna), dimensions variable. Lucas Knipscher's sprawling installation, The Back Is As Big As The Front, 2010, for instance, consists of an outlandish list of materials includes outlandishly detailed specifics: "Four texts from Camera Lucida by Roland Barthes"; "Heritage Hunting Plaid from Woolrich Fabrics"; etc., a farcical take on overwrought installation art — and, perhaps, the meticulously sourced banality of artists like Luc Tuymans. At the same time, Knipscher seems to be trying to sneak some small beauty of that process of producing commentary. 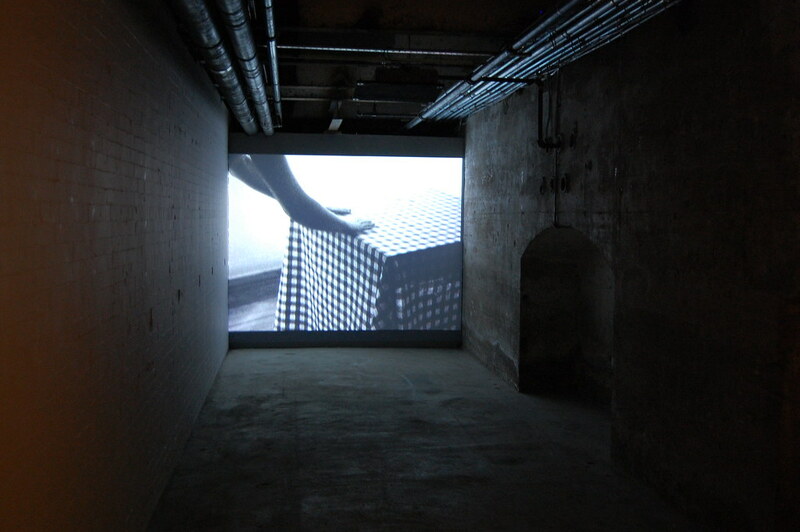 Nina Canell, Perpetuum Mobile (1800Kg), 2009. 30 liters of water, bucket, steel, hydrophone, amplifier, mist-machine, cable, 1800 kg cement, dimensions variable. Nina Canell, meanwhile, apes Rirkrit Tiravanija. 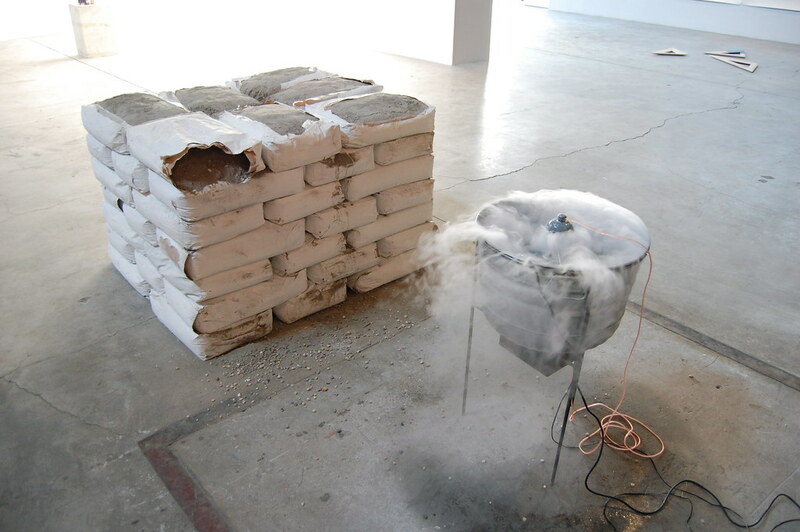 Instead of a smoking wok to serve food, she offers a bubbling, magical cauldron, which Johnson explains is vaporizing water, in order to harden the bags of concrete nearby. The visitor that misses Tiravanija's cooking gets to look at empty burners and pots. SculptureCenter visitors get to see the equipment hard at work but never witness any actual transformation. The artist, Canell jokes, works in mysterious ways. And yet, the piece is still faintly beautiful and mystical. (She did a larger, 2400Kg version at the Konrad Fischer Galerie recently: high-production-value conceptualism to fit a variety of spaces and needs.) 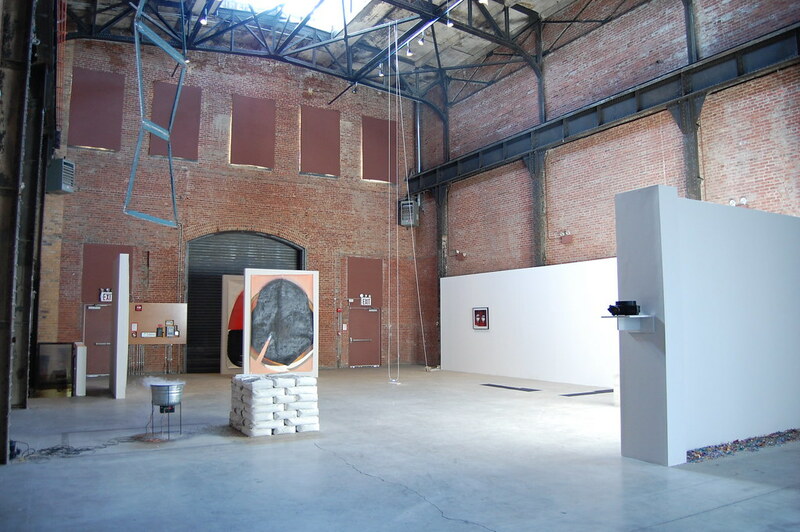 Her 2009 Flat Earth, in detail below at the bottom of this post, features a small piece of neon hanging from cords attached to the gallery's soaring ceiling. The Peter Fischli and David Weiss influence, which Johnson spots throughout the exhibition, is on display here, with just a touch of the perennially under-appreciated Keith Sonnier. Lucy Skaer, Untitled, 2009. 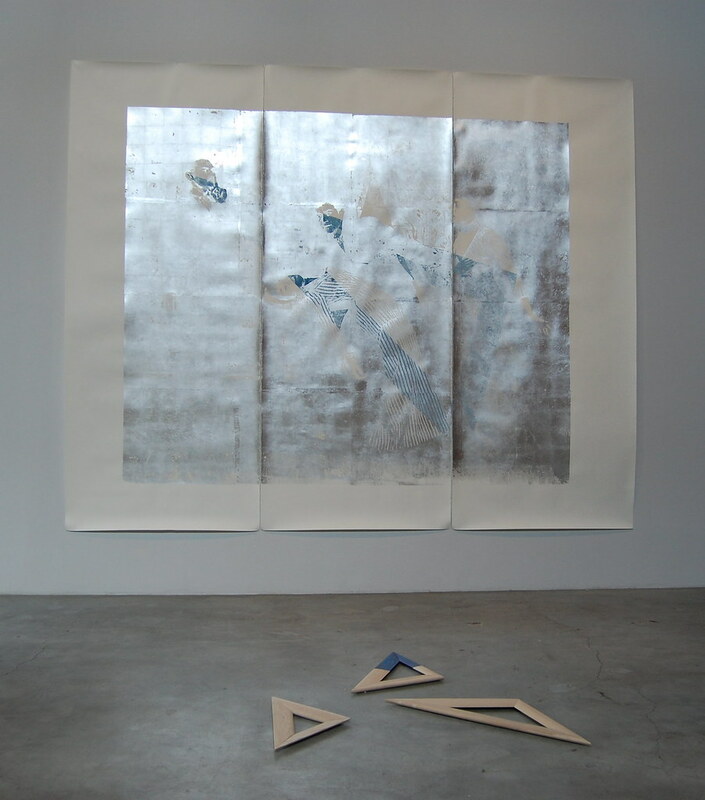 Watercolor and aluminum leaf on paper, 14 ft. 9 in. x 9 ft. 10 in. 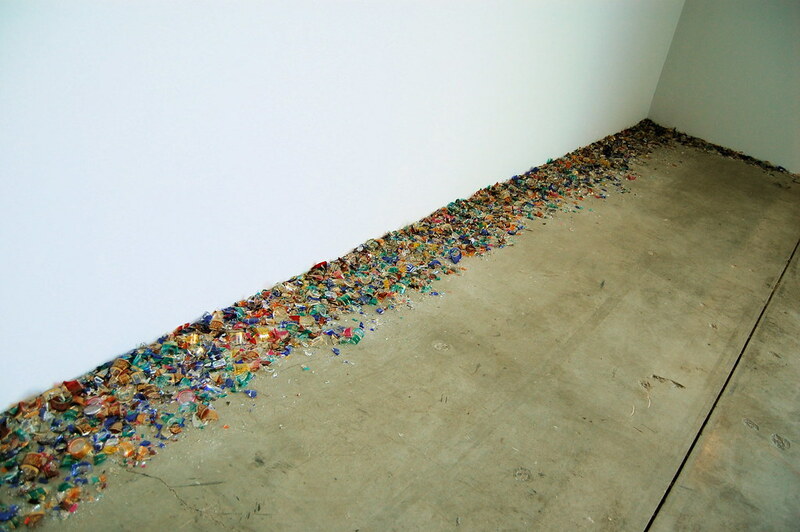 Writing in the Financial Times, Ariella Budick links Latifa Echakhch's long carpet of multi-colored broken glass, Erratum, 2004-10, to Robert Smithson's hefty pile of clear broken glass, Map of Broken Glass Atlantis, 1969, which is currently on display at Dia:Beacon. It's an apt comparison, with Echakhch's providing a simple, ornamental take on the Earth artist's hulking work. Indeed, none of the artists here has the ambition of a Smithson. No one is chasing revolutions — aesthetic, institutional, political, or otherwise. Duchamp and Cady Noland have shown that the only truly radical act left for artists is to quit making art, to stop visiting the temple altogether. However mild they appear, today's leopards want to look as they do here. Nina Canell, Flat Earth [detail], 2009. 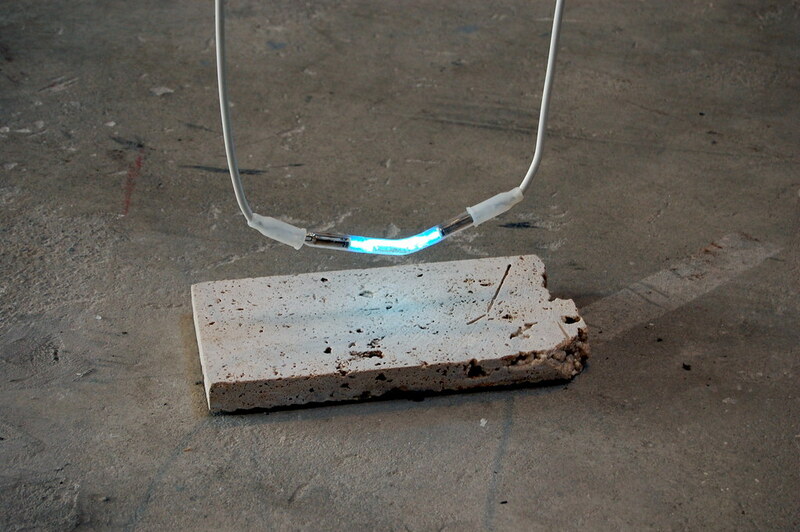 Stepping stone, neon, cable, 1000V, dimensions variable.